I was pretty sure I'd tried all the different varieties of the Fentiman's Brewed drinks range (with the notable exception of the Tonic Water which seems to be harder to get) but I was bought this as a present and it turns out I had confused it with the Dandelion & Burdock and had actually not got around to sampling this. Being the clichéd drink of the Famous Five and something that is mentioned a lot when English Summers are discussed I'd never really jumped at drinking it, and the name contains two things I'm not a massive fan of, ginger and beer. The flavour is quite a bit more organic than previous ginger beers that I have tried, and I'm not sure I'm that keen. I think that I forgot to upend the bottle and consequently the sediment at the bottom meant that the last glass was stronger in flavour and a lot too gingery for me. 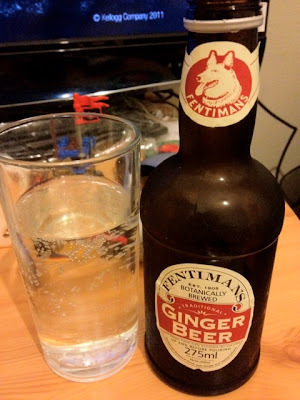 As it started the flavour wasn't too bad, and I have a tendency to not enjoy things with ginger in them as much as their plainer equivalents. As a result I think this is my least favourite in the range! I'd probably try this again on a nice summer's day just to make sure, but I'd be reaching for all the other bottles first. I'm a fan of ginseng too. I wonder what ginseng fermented drinks I can find?